August is one of the months this year that I am grateful for because of various blessings and experiences. Some of those that made me happy are the warehouse book sales from two of the known bookstores in the country. I already blogged my Books for Less Warehouse Sale experience recently. This time, it’s The Great National Book Store Warehouse Sale. The Great National Book Store Warehouse Sale was held last August 13 and 18, 2015, from 9:00 a.m. to 8:00 p.m., and was later extended to August 23, 2015. All items, from books to supplies to gift items, were on sale up to 90% off! Everything that I love was here, so I was very excited to buy books and some arts and crafts stuff. I heard about this sale before, but I never had the time, energy, or the money to go. For this year, I had those plus I was in a good mood for more bookstore sales. 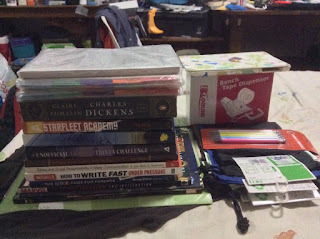 I decided to follow the reminders I listed in the Books for Less blog post and took account the warnings of people who went to the NBS sale on the first two days. Based on what my friends and what other people said on Facebook, the first two days were very toxic because there were many people and the handling of the crowd was disorganized. It was very crowded, the atmosphere was hot, everything was dusty and in disarray, and the line to the cashier was so long that it took two to three hours to just pay. After hearing this, my boyfriend and I prepared last August 15 by coming early, wearing comfortable clothes and shoes, bringing an eco bag, and bracing for the wave of people. The thing that made me think this day would be okay for me than the previous ones was when the security people became orderly in letting people in. The line stopped at the second floor once in a while throughout the day (even after our shopping) so as not to overwhelm the warehouse with so many people. I literally got excited when we reached the warehouse and saw EVERYTHING! I did not think twice anymore, got a 2-basket cart, and sprinted my way towards the book section while my boyfriend went to another section. When we got there, there were only a few people. But in less than 30 minutes, the whole place already became crowded and we were all shoulder-to-shoulder. It was a good thing I got the basket cart, as moving around became convenient. at the back of the warehouse. One of our strategies was to get all the books that we really like, put them in the basket, and sort them while waiting in line for the cashier. Since only a few people were there when we came in, I went straight to the book sections, where prices ranged from 30 pesos to P1000 pesos. I think the prices really dropped, as I got a 680-peso book for just 300 pesos. Great deals indeed! Before coming to the sale, my target was to buy Young Adult books. But as I went around, I saw other non-YA books that really piqued my interest and bought them instead. Most of them were non-fiction again and related to writing and media. We also bought books that we will give as gifts to our loved ones this coming Christmas. :D Apart from books, we also bought some supplies, such as pouch bags, an iPad casing, organizer refills, a clear book, pens, and a very durable tape dispenser. It was a great shopping experience and I would not mind going to another NBS warehouse sale again. The books on display were also great, though there were a lot of textbooks (I think that was expected from National Book Store). I am always a sucker for affordable books, so going to this sale and buying them at half the price was a wonderful experience!